Live music and legendary performers? Say no more! On Wednesday February 13th, Ottawa Life Magazine will host its first event of the new year in collaboration with Ottawa’s hottest new live music and entertainment venue, Overflow Brewery. From local music celebrities and state-of-the-art concert venues to a myriad of outdoor music festivals, Ottawa is the epicentre of music in Canada. In continuation of our support for local music and in celebration of Ottawa’s ever-growing music scene, we would like to invite everyone and anyone who is a part of this spectacular industry to attend including bands, musicians, festival organizers, producers, radio personalities and music lovers alike! This event will feature performances by rock band Better Living Through Chemistry, the legendary Town Cryers and CoverMe! Contest winners, The Tackies. Guests can look forward to live music, food and drinks, and a surprise (or two)! There will also be door prizes including a free recording session, two guitars and more. Admission is $10 and all ticket proceeds will be evenly split between both bands, with a portion being donated to Maison Libère Elle, a local women’s shelter. Once a staple in the city’s live music scene, The Town Cryers reached the number one spot on seven radio stations in Canada with their first release in 1987 called "All's Well.” Together, Jeff Tanguay, John Allaire, Rick Dixon and Kevin Smith toured across the country while at the same time releasing their 1989 CD, “Surprise Surprise”. The song included a supporting video which became the Top Independent Video in the country that year. Before parting ways in 1992, the band released their famous 18-track CD “Stanley’s Cup”. Don’t miss a special performance from these four veteran rockers as they bring their frontal guitar assaults and witty stage banter to Overflow Brewery on February 13th. Wherever The Tackies go, the party is sure to follow! They have been described as an Indie rock band with hints of alternative and punk. The four member band has performed alongside The Lazys, Pack A.D and Lights, and has entertained at several popular Ottawa venues including The Rainbow, LIVE! on Elgin, and The 27 Club. 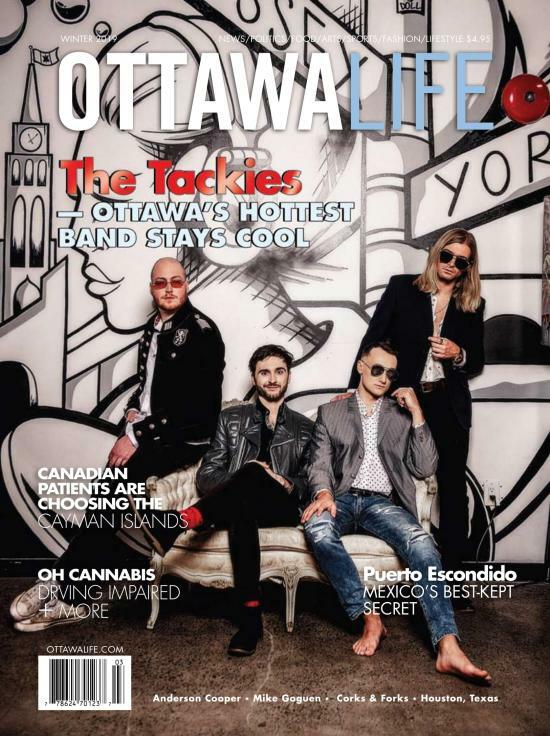 In just three short years, the band has completed their first tour, released a second EP and won Ottawa Life Magazine’s CoverMe! Contest. The Tackies have been experimenting with fun new sounds and are prepared to be propelled faster and farther. Don’t miss Vivian-Wenzel, Galen Cussion, Mathieu Malette and Jamie Orser as they headline the first annual Musiclude 2019! Better Living Through Chemistry is a straight up rock band, with clever lyrics, catchy hooks, and damn good songs. The five-member rock and roll collaboration has united, bringing together ex-members of Ottawa bands like The Setbacks, Boywonder, Crown Vic, and California Harvey. covers a wide range of everyday themes through their sound such as relationships, love, loss, determination and truth-- emotions we can all relate to. Music has always been a love of mine. She began writing songs in the mid-2000's and when she felt she had enough material she put a recording together. With elements of country, folk and bluegrass, her music will have any audience mesmorized. She's released two full length albums with some of the city's finest players including Juniper Weekends (2011) and Down the Road (2013). Bon believes that music has an incredible power to move and to heal those who come close it. Amanda Bon is going to bring a clean, refreshing performance to the Musiclude stage! Once a staple of the city's live music scene, the Cryers were known for their frontal guitar assaults and witty stage banter. The Digi 60 Festival takes place this weekend as it enters its 15th season We sat down with Emily Ramsay, the Co-Executive Director of the festival. With a second EP, the competition win and now a cover story, The Tackies are prepared to be propelled faster and farther.